Kate: Chelsie and I attended the Zandra Rhodes Afternoon Tea in February 2012, and as luck would have it this coincided with London's Fashion Week. I for one could not think of a more appropriate choice of Afternoon Tea in light of London's social calendar. This afternoon tea differs to the other teas we have attended so far because it has a fashion designers exclusive stamp. That fashion designer is the famed sixties designer Zandra Rhodes. This afternoon tea incorporates her bold bright style with things that she personally enjoys while blending the essential components of a traditional British Afternoon Tea. 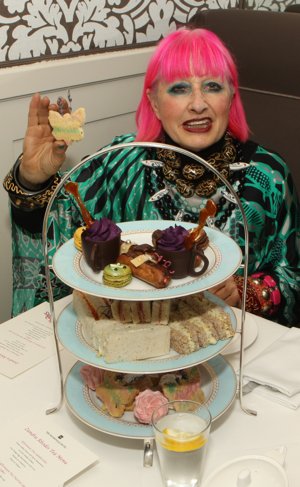 Chelsie: Zandra Rhodes is one of my favourite fashion designers so I was overwhelmed to discover her very own afternoon tea exclusively available at The Deville restaurant, in The Mandeville Hotel. The combination of The Mandervillie's fantastic shopping location, highly stylish interior and designer afternoon tea really does tick every amateur fashionist's box. We were shown to our immaculate table, and given a separate menu for the Zandra's Rhodes Afternoon Tea. The menu was beautifully presented listing firstly the traditional sandwich range which included; ham with dijon mayonnaise, scottish smoked salmon, free range egg mayonnaise and cress, chicken and cranberry and finally cheese and tomato. The second and third tier presented us with an insight into Zandra Rhodes bedazzling touch with this mouthwatering selection; ZR chocolate cup, jewelled eclair finger, butterfly lavender shortbread, pink meringues, Mandeville button macaroons and of course scones with devonshire clotted cream and strawberry jam. There was also an intimate selection of teas and herbal infusions, I selected Jing Darjeeling and Kate selected whole rose buds herbal infusion. Kate: I was generally taken a back when the afternoon tea stand arrived. The beauty, the attention to detail, the care that has gone into creating this tea was evident. We began by enjoying the delicate sandwiches, it was then we spotted our first purple butterfly infused into the afternoon tea china. The butterfly, is Zandra Rhodes signature butterfly based on her classic fabric prints. Our attentive waitress then informed us that not only had Zandra designed the afternoon tea menu but she also designed the Royal Doulton fine bone china that each tier of our Afternoon Tea sat on- Isn't that just lovely? I greatly enjoyed the variety of choice with the tea pastries, and the discoveries along the way! For example the jewelled eclair finger with first bite oozed delicate pink cream rather then the traditional white. My favourite items without doubt were the pink meringue and ZR chocolate coffee cup, but Chelsie's preference firmly resided with the button macaroons. This really is a lovely fantasy afternoon tea, and Chelsie and I the tea was on a continual flow as we indulged and discussed fashion.